Serving in Bengal as a captain of the East India Company, Jonathan Scott (1753-1829) became a private Persian translator to Governor-General Warren Hastings in 1783. A gifted orientalist, he was elected a member of the Asiatic Society of Bengal in 1784, returned to England in 1785, and a year later published the first of his many translations, Memoirs of Eradut Khan (also reissued in the Cambridge Library Collection), shedding light on the Mughal empire in the seventeenth century. 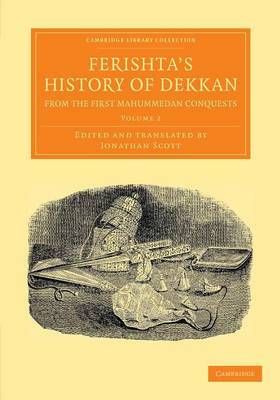 This two-volume work, published in 1794, narrates the fortunes of the Islamic kingdoms in southern India from the thirteenth century onwards. Based around translations from various manuscripts, Volume 2 covers the conquest of the Deccan Plateau by the Mughal emperor Aurangzeb, the rise of the Maratha leader Shivaji and the reigns of the later Mughal emperors. Also included is an account of the state of Bengal from the mid-eighteenth century.